Matcha Powder, this powerful green tea powder is full with antioxidants, it supports immunity, metabolism... It is a bit expensive but it is the key ingredient for this recipe, it gives the chocolate bars an earthy taste, slightly bitter and a really nice vibrant colour. You can make many things with it: tea, facial mask, chia pudding, ice cream... maybe something to give it a try! Place the pumpkin seeds in a food processor and grind just for a couple of seconds (we want to keep some chunky pieces). Pour the chopped seeds in a big container and also the chia seeds. Add the dates, coconut oil in the food processor and process. Combine the date paste with the seeds, add the cacao powder, sea salt and one tea spoon of matcha powder, until the mixture stick together. Place the mixture in a form, covered with non-stick parchment papper. Place the form in the freezer for at least two-three hours. 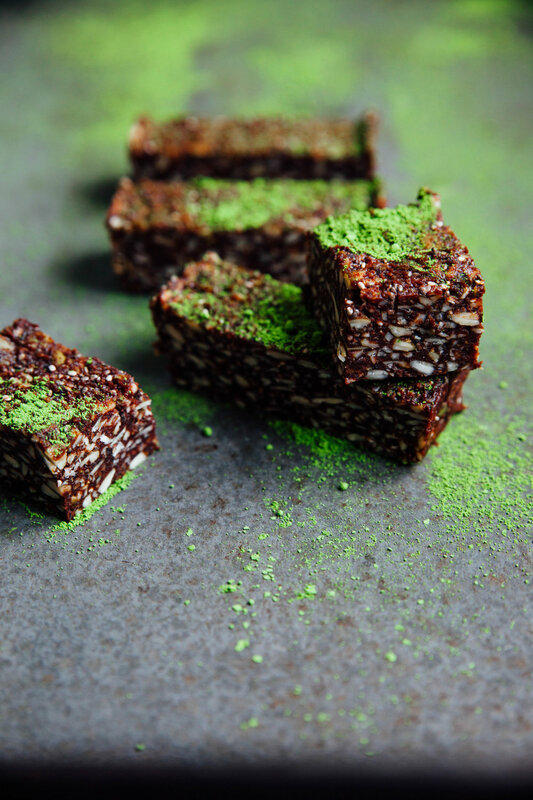 Remove from the form, dust the chocolate bar dough with matcha powder and cut into small bars. Keep the bars in the fridge in a container, ready to eat at anytime!